Be creative with your classroom treats this Valentine's Day! It's easier than it seems, and will leave smiles on the faces of all the kids -- and the teacher! Purchase yummy heart-shaped cookies (like these, from Cheryl's) and place them in individual cellophane bags (found at craft or candy supply stores). 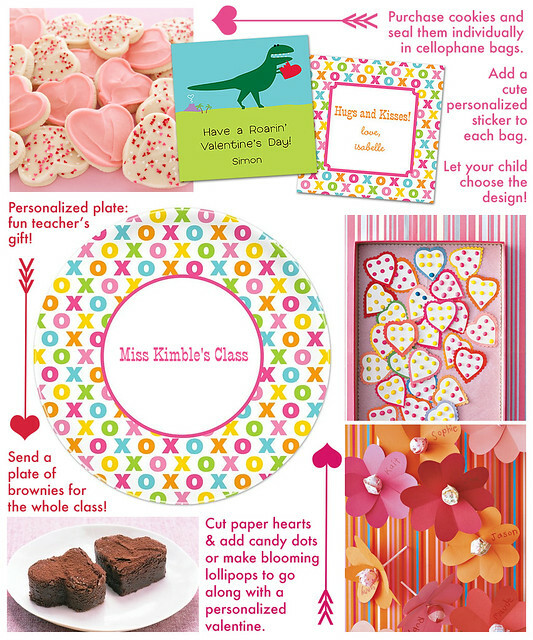 To make the treat even more special, add a personalized Valentine's Day sticker! Let your child choose their own fun design. Personalize a melamine plate with the teacher's name, and fill it with brownies that have been cut with a heart shaped cookie cutter. After all of the students have the brownies, the teacher can keep the plate in the classroom! Valentine's Day is more fun with sweets, so create candy hearts or blooming lollipop treats to accompany personalized Valentine's cards.